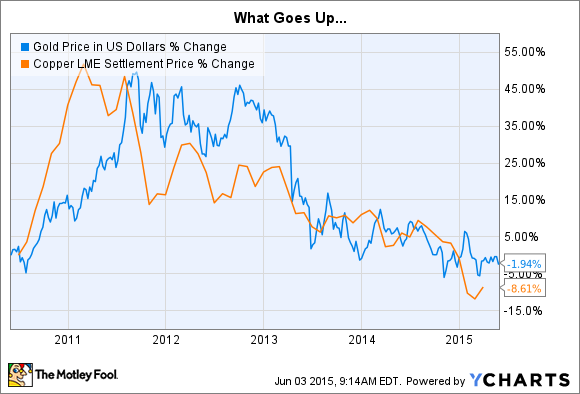 Can Barrick Gold Corporation Afford to Keep Paying Your Dividend? Barrick Gold is trying to pay down debt, but it can't do that without finding more cash ... is another dividend cut possible? Barrick Gold Corporation (USA) (NYSE:GOLD) took on a lot of debt to acquire and develop projects that didn't pan out. Now it has to deal with the aftermath of those decisions. For shareholders who have already ridden the shares down over 70% in past five years, is more pain on the horizon? At the end of 2010, Barrick had around $6.7 billion worth of debt on its balance sheet. By the end of 2011 it had nearly $13.2 billion. That increase was largely related to the company's 2011 purchase of copper miner Equinox. Debt as a percentage of capital went from about 26% to roughly 36%, not a huge deal. The fly in the ointment here is that gold and copper prices were heading toward a peak in 2011. They have since been heading in the opposite direction. This, in turn, has resulted in multiple write offs at Barrick, including goodwill impairments and asset impairments for operations that simply didn't pan out as expected, taking shareholders' equity from around $24.1 billion at the end of 2011 to $10.2 billion at the end of 2014. The stalled Pascua-Lama project alone accounted for over $6.4 billion in asset impairment charges over the last two years. To be sure, some of the write offs are related to the drop in commodity prices. But far too many, like Pascua-Lima and Cerro Casale, which saw a nearly $1.5 billion asset impairment charge last year, are related to expansion efforts that didn't work out as planned. And in the end, the change in shareholder equity has altered the debt equation in a huge way: At the end of 2014 long-term debt made up 55% of the capital structure. For a company that sold toothpaste that might not be too worrisome. But Barrick sells volatile commodities in an industry with high fixed costs. For example, revenues have gone from $14.3 billion in 2011 to $10.2 billion last year. That's a decline of nearly 30%. But cost of goods sold actually increased slightly over that span, so the company's gross profit fell from nearly $8 billion in 2011 to $3.4 billion last year. That's a drop of nearly 60%. To deal with this, Barrick has been cutting costs. It's had decent success, too, reducing its all-in sustaining costs for gold about 15% between 2012 and 2014 and reducing the cash cost for copper by about 6%. It's also been pulling back hard on capital spending, like almost every miner out there. Oh, and it cut the dividend by 75% in 2013. That means shareholders are lending a big helping hand on the cash flow front, since less cash in your pocket means more cash for Barrick to play with. And now that the company has gotten lean and mean on the operating front, it doesn't have many more places to look for cash. That makes the 2015 goal of reducing debt by $3 billion, so it can finally start to clean up the balance sheet, a difficult one to achieve. Which is why another strategic priority this year is refocusing around its core mining operations in the Americas. These are generally its lowest cost mines, so its a good call. Everything else is up for grabs, meaning operations could be sold or Barrick could take on partners to reduce its expenses. These are all logical decisions in a downturn. But they have implications for shareholders. For example, until debt levels are appreciably lower, don't expect Barrick to start sending more cash your way. The wild card here, of course, is the price of gold and copper. If prices head higher, Barrick will have a lot more financial leeway. But for right now, Barrick is in a tough spot, scrounging for cash to pay down a burdensome debt load left from the go-go years. And that leaves shareholders waiting in line for dividends. In fact, Barrick could save around $240 million a year if it eliminated its dividend. Is that a possibility? Dividends ate up nearly two-thirds of net income in the first quarter, so it's a notable expense. More so when you consider that cash provided by operating activities (which adds back non-cash items like depreciation to operating income) didn't come anywhere near covering the miner's investing activities (capital spending to maintain and grow its business) in the first quarter. That said, it looks like Barrick is committed to maintaining its quarterly dividend. However it can only keep paying that and reduce debt if it finds money elsewhere. So watch the company's efforts as it looks to raise cash, and reduce costs, by jettisoning unwanted assets and reduce development expenses by taking on partners at difficult and/or expensive projects. Success in these efforts might just determine the fate of your dividend payments.